How many antique stores are started by teenagers? Probably not many, but one in particular—Past to Present in downtown Niantic—has that distinction. Josh Haderski opened his shop six years ago at the age of 18, but even then, he was no newcomer to the world of collectibles. Antique stores have their own particular charm, depending on what you like, but more importantly, what the owner likes. Haderski acknowledges that a store reflects the owner’s eye and taste, so the items in a store are often unique to that owner. 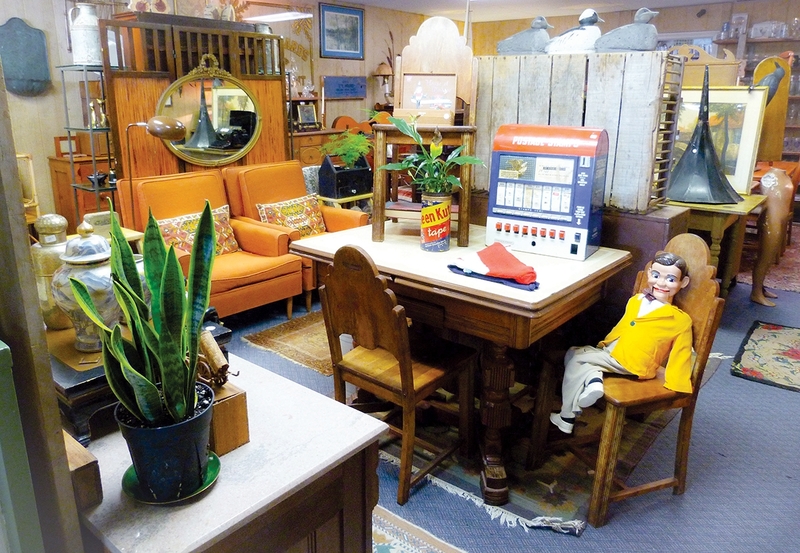 Haderski likes mid-century furniture and design, nautical pieces, and local history items. Partial to sports cards, he also carries collections he finds, primarily vintage 1960s and earlier. Haderski and his staff re-stage the layout every Thursday. “We move a lot of stuff around,” he says. To keep his shop well-stocked with new finds, Haderski goes to auctions, buys through estates and also manages estate sales. In addition, he purchases individual items and acquires collections. This keeps him busy, but he still finds time to attend a few antiques shows a year, especially the Brimfield Antique Show and Flea Market in Massachusetts. In addition to the three Brimfield shows, Haderski does a smaller show at the Lebanon Green, and the Glastonbury New Year’s Day show, plus he participates in the sidewalk sales and local events in downtown Niantic. As if maintaining a fully-loaded store isn’t enough, Haderski and his staff also conduct estate sales where they appraise the contents of the house, then price, and stage the home for the sale. Once the sale is finished, they do a full cleanout. Online, the store has well-designed and up-to-date pages on eBay, etsy, and Facebook. Whether you’re looking for a cast-iron skillet, an antique armoire, or a 1963 Hank Aaron baseball card, Past to Present might just be the place to find it. Past to Present is located at 260 Main Street, Niantic, CT 06357. For more information call 860-449-3312; email pasttopresentct@gmail.com or visit pasttopresentct.com.